Find our cheapest flights to Hong Kong from Auckland, Wellington, Christchurch, and Queenstown. Savour exciting Hong Kong's varied and contrasting delights, from natural splendour to vivacious nightlife. 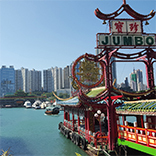 Hong Kong's a melting pot of eastern heritage, global glamour and delectable cuisine. You'll be as dazzled by its ancient history and natural beauty as you will be by the vibrant lights that paint the sky each night. It's the city's stark contrasts that make it so enthralling. Do you check out the buzzing local markets or peruse glitzy shopping malls? Stroll through serene temples or hit the theme parks? And when the sun goes down, will it be underground eats or rooftop drinks? The activities list for Hong Kong is as big as the city. And when you settle on something, you'll quickly learn that getting there is part of the fun. Cable cars, trams, iconic junk boats, a world-class metro and the world's longest outdoor escalator - there's every sort of ride for you. Hong Kong is much more than an eastern metropolis, over 70% of the region is made up of sprawling parks, islands and mountain ranges, sprinkled with charming villages and historic sites. Venture to one of its many islands and you'll be rewarded with breath-taking views and total tranquillity. Cable cars, trams, junk boats, a world-class metro and the world's longest outdoor escalator ­- there's every sort of ride. As for cuisine, tasting your way around a city has never been more enjoyable, with 61 tongue-tantalising Michelin star restaurants and multiple markets packed with local street food. From simple and delicious to obscure delicacies, it's all here. Hong Kong's eclectic attractions make it an ideal escape for adventurers, indulgers, partiers and families. You'll often feel like you've seen three countries in a day, making shorter visits almost as fulfilling as longer vacations. Summer is hot, humid and wet, so most people choose to visit Hong Kong from October to April. It depends on your tastes, but if you’re an average traveller you should allow about USD $100 to $150 a day per person for food and entertainment. There are no mandatory vaccinations required for travel to Hong Kong, however tetanus/diphtheria and hepatitis A are recommended. Nationals of the USA, Europe, Australia, Canada and New Zealand don't require a visa to enter Hong Kong. Nationals of the UK are also visa-free and can stay for up to 180 days.